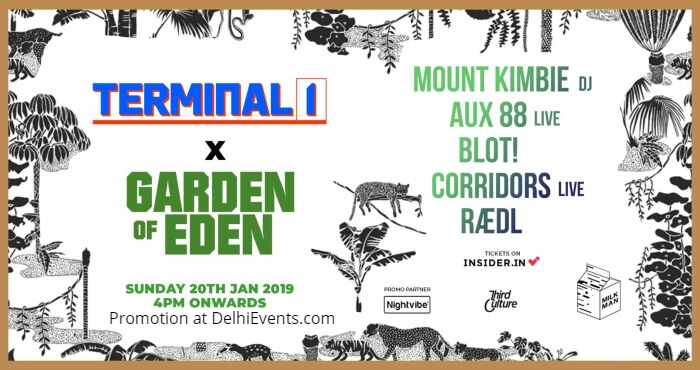 Terminal 1 (Milkman) in collaboration with Garden of Eden (Delhi’s newest outdoor pop-up) present to you a day of sunshine and beats featuring the incredible Mount Kimbie (DJ Set), Detroit legends Aux 88 (Live) & Delhi’s impeccable BLOT! supported by homegrown talent Corridors (Live) & RaeDL. The effect was that of an electrified old school hip hop show. It isn't accidental. Aux 88 is one of the few who remember that techno has its roots in the hip-hop of pioneers like Afrika Bambaataa, Planet Patrol and Newcleus. If anyone mistakes their live show as a scaled down electronic hip hop oriented Parliament show, well, you're not too far off the mark. After the success of "Man or Machine," BJ left to explore other musical realms while Tom Tom went on to record "Xeo- Genetic," the last Aux offering on Direct Beat records. The Album received two Detroit Music awards for Best Artist and Best Recording. Less a piece of music and more a natural phenomena, the In Transit EP from Corridors proffers both lava and light. In its current environment, the former metal drummer’s oceanic embrace of synthetic, machine music feels at times like a balm soothing over a darkening reality, and other times, a slowly-fermenting chemical charge that deflagrates your delicate middle-ear membrane. Corridors is the New Delhi- based Rijul Victor.